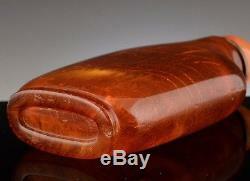 RARE CHINESE CARVED NATURAL BALTIC BUTTERSCOTCH CHERRY AMBER SNUFF BOTTLE. Thank you for having a look at my auctions. We are very excited this week to be featuring our third and last session of items from the Important estate collection of the late Michael Vermeer. Vermeer is literally a famous figure when it comes to Chinese ceramics starting his career in the late 1960s in his early 20s. With close to 50 years experience Mr.
Vermeer was thought by many to be one of the worlds top Chinese ceramic experts and authorities. I believe this is one of our finest sales to date featuring many of the choice and most important examples from the collection. I do wish everyone the very best of luck winning the auctions! 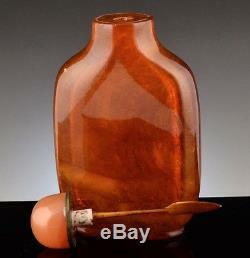 This snuff bottle is one of two very rare natural amber examples being offered from this important estate collection. This snuff bottle is a rarely found and authentic example that is fully guaranteed to be carved of a natural piece of authentic amber. This snuff bottle has been closely inspected by our local gemologist we have worked with for upwards of ten years. 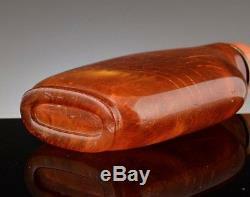 They have confirmed this snuff bottle is carved of authentic and natural untreated cherry amber. You can also see the light crazing throughout the snuff bottle which is also a very good sign that this is in fact a natural amber carved example. 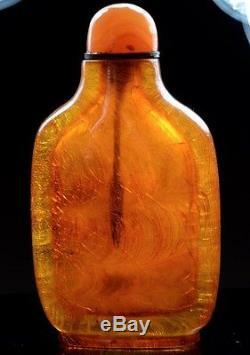 This snuff bottle is a beautiful example that has some interesting natural features in the amber. The snuff bottles interior is also very finely and deeply carved throughout. The snuff bottle has some very tiny flasks to the top and base rim that could be buffed out if one desired. Overall for its age the snuff bottle is in substantially fine condition with no other damage or repairs. The snuff bottle measures 1 3/4 inches long, by 3/4s of an inch wide, and stands 2 5/8 inches tall by itself and 3 1/8 inches tall with its lid. 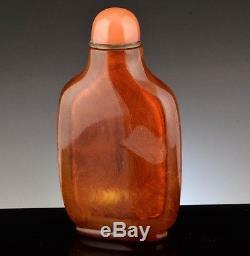 The amber snuff bottle without its lid weights 34.9 grams. 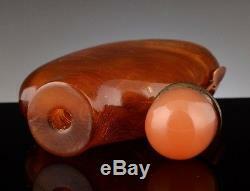 I believe natural amber examples like this are exceedingly hard to find. BEST OF LUCK WITH THE AUCTIONS! All Canadian Residents will be charged HST Based on Address. We make great effort to honestly and accurately describe each item listed. Items are not returnable if it is not of the age or value you were hoping it to be, with No Exceptions. Many of the items listed are old antique pieces and in many cases over a hundred, or hundreds of years old. As a special Courtesy to our wonderful customers we are now offering Layaways. Small Sample of the 175+ Estate Auctions listed this week! Powered by SixBit's eCommerce Solution. 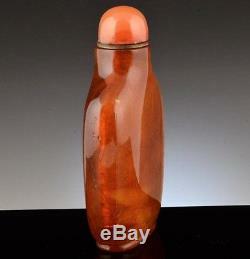 RARE CHINESE CARVED NATURAL BALTIC BUTTERSCOTCH CHERRY AMBER SNUFF BOTTLE" is in sale since Saturday, March 26, 2016. This item is in the category "Antiques\Asian Antiques\China\Vases". The seller is "joanies_house_of_treasures" and is located in Barrie, Ontario. This item can be shipped worldwide.